I had arranged with Zaldy Angulo (09082762553) for us to stay in Villa Hermosa Guest House in Coron. We were a group of four friends so I was specifically looking for an aircon room (many blogs I read said that there were lots of mosquitoes in Coron and I wanted to avoid them) with a private bath, and possibly quadruple sharing. I chose Villa Hermosa mainly because I liked the pictures of the room and it only costs Php 2000 a night for the four of us. It had two double beds and a cable tv. Zaldy isn't actually the owner. He's the one who manages their website and I believe he also manages the websites of several other budget guest houses all over coron. The owner of the place is Susan de la Rosa (09293204018), a small, thin woman who kindly saw to all our needs and made us feel welcome. I also informed Zaldy that we wanted to be picked up from the airport when we arrived. We flew with Cebu Pacific to Busuanga Airport and arrived 20 minutes ahead of schedule, around 10am. Our van driver was already waiting for us with a WELCOME sign with my name on it. The drive to Coron town proper took around 35 minutes and cost Php 150 per person. We enjoyed the scenic view of the land and observed lots of cows grazing in the area. Our driver delivered us right in front of Villa Hermosa which was in the heart of the town. Our room was Room 88 and it was just like in the picture. It was clean and cozy. Towels were provided and there was a pull-out extra bed under our bed for a 5th person. The toilet and bath were kept separate. After leaving our things and quickly changing to island-hopping getup, we proceeded to look for a tour while it was still morning. However, we had a quick lunch first in a nearby carenderia. We stopped near Coron Travel and Tours, just in front of Coron Bistro (also near La Sirenetta) and hired a bangka for Php 1,500. We had a Rodnel, a nice and very informative boatman who gave us tidbits about each place we visited. Our first stop was Siete Pecados (Php 100 entrance each), where we snorkeled. Just be careful of sea urchins! They are plentiful and the area was so shallow, we could actually step on the corals (but didn't, of course). Then we were off to Barracuda Lake (entrance Php 100). This is one of my favorite places as it has the quality of a hidden nook with huge rocks all around and a beautiful blue lake. The water is very deep and rumor has it that there are seven large barracudas living in this lake. I took some shots of the underwater rock formations before I realized my camera got wet. Whoops! 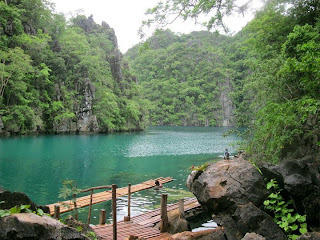 Our next stop was one of the strangest places I had been to, the Twin Lagoons (entrance Php 100 per person). I wasn't used to the water being icy cold on the surface and warm below but due to the constant motion, the cold water would still swirl around my legs, making me shiver. Here, we needed to dive (or carefully swim along the surface lest you hit your head on a rock overhead) under a rock formation to visit the second lagoon (hence Twin Lagoon), where boats couldn't reach. We then visited Banol Beach (entance Php 100), a pretty beach with powdery white sand, like in Boracay. We didn't swim here but rather explored the rock formations and took a LOT of photos. We also visited the Skeleton Wreck but opted not to snorkel (else pay the entrance Php 100) because according to our boatman, the Lusong Gunboat can be more clearly seen as it sank in shallower water than the Skeleton Wreck. It was nearly 5pm when we headed back to the town. We tipped our boatman for the fun tour then decided to try Coron Bistro later that evening for dinner. But first, we had to hurry and buy our food for the next day's adventure. We planned to go to Calauit so we needed to buy the food we would cook there, before the market closed. I wanted to buy seafood but the market was out of good-sized shrimp on that hour and one of my friends didn't eat fish (sigh) and crabs were hard to eat so we bought pork instead, to barbecue for lunch. We also bought soy sauce, and other stuff to marinate our pork with, two bags of coal, a large Wilkins water container and some snacks. The caretaker of our lodge arranged with Binalot to have our breakfast ready by 2:30am the next day. Our Tapsilog cost Php 80 per person and the rice we would take for lunch was a courtesy from our guest house. Aren't they wonderful? I was nearly exhausted by the time we headed to Coron Bistro for dinner. We had their (really delicious!) kinilaw, Tenderloin Steak and spring rolls (lumpia). For desert, we sampled something that was made of banana slices in orange sauce but I forgot the actual name, and another desert which was like pancakes in the same sticky sweet sauce. I think it's name was Crepe Suzette or something of the sort. After dinner, we headed straight back to Villa Hermosa to rest. We watched National Geographic before finally drifting off to sleep.